Valley & Mountain is a new spiritual community/church in the Rainier Valley. Our mission is to build a radically hospitable community, rooted in grace, that practices deep listening and creative liberation. We celebrate the diversity of age, race, gender, sexual orientation, primary language, and spiritual identity in our community and our neighborhood and strive to create an inclusive environment. Join Valley & Mountain for our next Celebration on Sunday, December 18 4-5:30 in the Columbia School building, 3651 S Edmunds St.
Celebrations are dynamic, participatory experiences that involve 3 movements. Participants choose how to spend the first 30 minutes (people gather in different rooms to do activities like meditation, making sandwiches for the food bank, yoga, arts, poetry-writing, music, etc). Next, we gather for a reflection from John. Finally, we move to tables for conversation on the topic of the day over a light meal. We're currently having Celebrations on the 3rd Sunday of each month at our new location (3651 S Edmunds St in Columbia City). We hope to see you at a Celebration or at one of our other events! 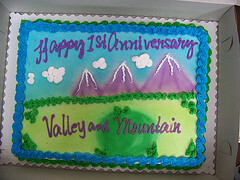 Find out more at valleyandmountain.org.